The term “apolitical war documentary” has a particular dishonesty to it because it is hard to believe that a feature containing real deaths doesn’t have some kind of anti-war agenda to it. 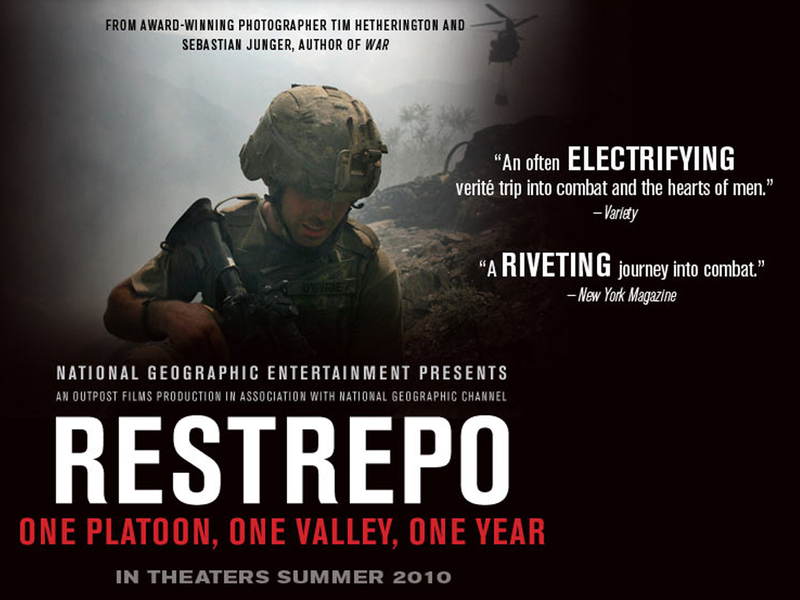 Restrepo, a real deal guerilla documentary, isn’t obscenely graphic in presenting the deaths but it is as vicarious in combat as you can get – that level of down in the ground intimacy can be riveting. 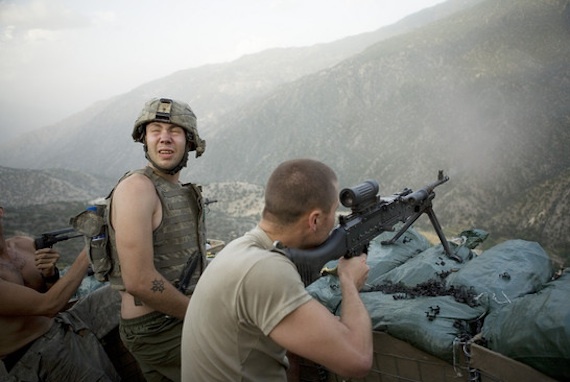 Tim Hetherington and Sebastian Junger are the credited directors, and cinematographers, who were not only there, but risked their necks out in the Korengal Valley in Afghanistan. The cameras arrive on location along with the platoon, with an attack on the very first day. They build their own outpost, named after Restrepo, a medic who became the first casualty, and the shaggy construction is as ragtag as the battle company. The outpost rests on a hillside that is exposed to everyday fire. Interspersed interviews inform us that “It was considered one of the most dangerous postings in the U.S. military.” The soldiers will spend a year there, some admitting nakedly that they didn’t read too much into the area before their arrival but now are afraid that they will die there before the end of their tour of duty. There is not an interview subject that isn’t interesting, but even though their reminisces are supplied post-combat, you feel their existential distress. The film is allowed stretches of no-combat oxygen with the young men jollily horse-playing and singing guitar songs. But the film knows its business of why they are there and with an elongated green valley difficult to scale and travel sideways, it results in long range gun battles. The soldiers, and the cameramen, actually get themselves ambushed from all angles at high elevation at one particularly scary, intense segment. This is very hairy, as you would describe an action film. 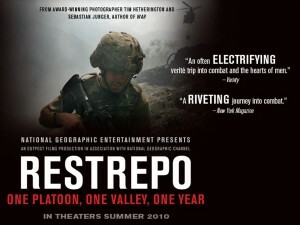 “Restrepo” is a rare work of courage, first and foremost, for actually being there during its hairy moments, and for showing you a part of Afghanistan and its insurgents that you had probably not seen or considered previously. The film has a lack of commentary at times, but you do witness pathetic attempts at diplomacy between infantrymen and Afghanis. Yet for all its rawness the film suffers for not having an organized narrative structure or sturdy timeline. That’s the tradeoff supposedly, skimping on the implications of world history for the sake of personal soldier history. The camerawork and editing meets first-rate standards especially for a guerilla piece. Even though its apolitical for its lack of words, lack of speeches, it is hard to not find this anti-war when you witness soldiers bawling right on camera. And what did the boys accomplish for the U.S. military in their year on duty? Hmm, that question might even puzzle them. Film Cousins: “Why We Fight” (2005); “The Ground Truth” (2006); “The War Tapes” (2006); “No End in Sight” (2007).